FT: Plymouth Parkway 2 (Williams 42, Trott 54) Bridport 1 (Butcher pen 60) Parkway went into the game against mid table Bridport looking for their 12th consecutive league win (14 in all competitions) and maintain their challenge for the league title. Two changes were made from Wednesday's victory over Bitton with Rob Farkins and Jordan Trott returning to the starting line up with Christian Pople dropping to the bench. With another decent crowd of 180 in attendance and playing against a very strong, wind. Parkway made a fast start creating a couple of early chances with Shane Krac seeing his shot well saved and a Teigan Rosenquest close range effort blocked by keeper Jason Hutchings on 3 minutes. Parkway continued to threaten and a good ball from Jamie Lowry to Rosenquest saw his dangerous cross cleared to safety. Bridport gradually got to the pace of the game and on 13 minutes James Cox saw a long range effort fly just wide. With both sides having difficulty adjusting to the windy conditions and heavy pitch, Bridport continued to compete well with the dangerous Edward Butcher shooting just over from 20 yards on 14 minutes and Braeden Symes also going close from their next attack. Parkway responded well and a good move through the midfield on 16 minutes was ended with Mikey Williams being hauled down by Mark Salter around 35 yards from goal resulting in a yellow card for Salter. The subsequent free kick was well parried by Hutchings followed by a frantic goal mouth scramble with Parkway unable to convert and the ball eventually being cleared. Butcher and Ben Morris continued to cause the Parkway defence problems as play became scrappy, lacking any real quality with Parkway guilty of conceding possession too easily. A Bridport freekick from around 25 yards was only partially cleared allowing Morris to fire in a snap shot which went just wide. Bridport continued to compete strongly in midfield with Parkway unable to get any rhythm into their play or get their playmakers into the game. However, they almost took the lead on 37 minutes when good play on the right by Ryan Lane saw his cross find Williams at the far post whose header was blocked and his follow up shot flash narrowly wide. After a couple of avoidable offside decisions going against them, Parkway finally took the lead on 42 minutes. Lane won the ball in midfield and released Williams who outpaced the last defender, drew Hutchings and despite not getting a perfect contact, slotted home from around 12 yards via the base of the far post.The goal continued Williams remarkable run of scoring in every one of Parkway's last seven games. Butcher and Morris continued to see plenty of the ball but lacked penetration in the final third allowing Parkway to defend comfortably. Parkway almost doubled their lead on the stroke of half time with Carter seeing his shot blocked after more good work by Williams. A scrappy half in difficult conditions with Parkway just about deserving their lead with a determined Bridport also threatening occasionally. With Parkway now playing with the wind behind them, they created a couple of early chances with Carter being thwarted on both occasions by Hutchings. With Parkway now moving the ball much quicker and sharper and Lowry and Krac becoming more influential, they now had a period in control forcing Bridport to defend deeper. On 52 minutes a fine run and clever skill by Williams saw him get into the 18 yard area only for his angled drive to hit the post. With Parkway now applying constant pressure, Krac had a shot well saved before they increased their lead on 54 minutes. A corner on the right from Trott was whipped in on the wind to the back post which may have just shaved the head of Salter before entering the top corner with Trott deserving the credit with the quality of his delivery. The dose was almost repeated on 56 minutes when another inswinging corner from the right by Trott hit the near post and going behind for a goal kick. With Bridport looking to play on the break, against the run of play, they got a lifeline on the hour. A long ball down their left saw a Sam Hillson back pass fall short of Kyle Moore forcing the keeper into conceding a penalty which was duly despatched by the impressive Butcher sending Moore the wrong way. The goal gave Bridport some impetus as they continued to battle well with Parkway's play becoming disjointed. Both sides began to introduce substitutes with Sam Clark replacing Leighton Thomas for Bridport on 64 minutes and Pople and Jordan Annear replacing Rosenquest and Carter respectively on 68 minutes. Bridport were now forcing the pace and another good strike from Butcher was well saved by Moore followed by a second crucial save this time with his feet from the same player. On 77 minutes a fast break from Parkway saw a dangerous cross from Lane bounce awkwardly for Williams who somehow spooned over from 5 yards. Mike Smith replaced Lane shortly after as Parkway weathered the storm and regained some control. Annear was sent clear on 88 minutes only to be dragged down around 30 yards out by Kameron Andrews who received a yellow card when arguably the last man. The resultant free kick was blocked with Krac and Matthew Condliffe also being booked as the game came to an untidy, scruffy conclusion. The final chance fell to Annear in stoppage time when, after a good passage of play, his fierce shot was blocked with a last ditch tackle. A workmanlike, patchy performance from Parkway against a hard working, well organised Bridport in which they just about deserved the points. 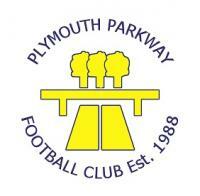 The effects of the heavy conditions and their hard midweek game probably contributed to Parkway looking heavy legged at times but yet again they did enough to grind out the win which, with more clinical finishing, could have been more comprehensive. It's as you were at the top with Parkway remaining in 2nd place a point behind Willand who won 1-0 with a late goal and 3 points ahead of Bitton who also won despite having their keeper sent for the second time in 4 days! Parkway now travel to 4th placed Westbury next Saturday looking to keep the winning run going and avoid being "doubled" for the first time this season. Thanks to Graham Lloyd for the excellent summary.